An international team of researchers led by Oxford University has new dating evidence indicating when the earliest fully modern humans arrived in the Near East, the region known as the Middle East today. They have obtained the radiocarbon dates of marine shell beads found at Ksar Akil, a key archaeological site in Lebanon, which allowed them to calculate that the oldest human fossil from the same sequence of archaeological layers is 42,400–41,700 years old. This is significant because the age of the earliest fossils, directly and indirectly dated, of modern humans found in Europe is roughly similar. This latest discovery throws up intriguing new possibilities about the routes taken by the earliest modern humans out of Africa, says the study published online by the journal PLOS ONE. The research team radiocarbon dated 20 marine shells from the top 15 metres of archaeological layers at Ksar Akil, north of Beirut. The shells were perforated, which indicates they were used as beads for body or clothes decoration by modern humans. Neanderthals, who were living in the same region before them, were not making such beads. The study confirms that the shell beads are only linked to the parts of the sequence assigned to modern humans and shows that through direct radiocarbon dating they are between 41,000–35,000 years old. The Middle East has always been regarded as a key region in prehistory for scholars speculating on the routes taken by early humans out of Africa because it lies at the crossroads of three continents – Africa, Asia and Europe. It was widely believed that at some point after 45,000 years ago early modern humans arrived in Europe, taking routes out of Africa through the Near East and, from there, along the Mediterranean rim or along the River Danube. However, this dating evidence suggests populations of early modern humans arrived in Europe and the Near East at roughly the same time, sparking a new debate about where the first populations of early humans travelled from in their expansion towards Europe and which alternative routes they may have taken. In Ksar Akil, the Lebanese rockshelter, several human remains were found in the original excavations made 75 years ago. Unfortunately, since then the most complete skeleton of a young girl, thought to be about 7–9 years of age and buried at the back of the rock shelter, has been lost. Lost also are the fragments of a second individual, found next to the buried girl. However, the team was able to calculate the age of the lost fossil at 40,800–39,200 years ago, taking into account its location in the sequence of archaeological layers in relation to the marine shell beads. Another fossil of a recently rediscovered fragment of the upper jaw of a woman, now located in a museum in Beirut, had insufficient collagen to be dated by radiocarbon methods. 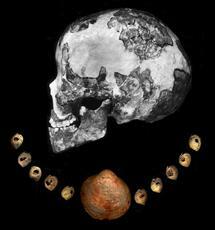 A method using statistical modelling was used to date by association the jaw fragment at 42,400–41,700 years old. Ksar Akil is one of the most important Palaeolithic sites in Eurasia. It consists of a 23-metre-deep sequence of archaeological layers that lay undisturbed for thousands of years until a team of American Jesuit priests excavated the rockshelter in 1937–38, and again after the end of the Second World War, in 1947–48. The cave layers were found to contain the human fossils and hundreds of shell beads, as well as thousands of stone tools and broken bones of hunted and consumed animals. The earliest European modern fossil, from Romania, dates to between 42,000–38,000 years before the present time, and specialists have estimated the age of Kent's Cavern maxilla from southern England, between 44,000–41,000 years, and that of two milk teeth in southern Italy, at 45,000–43,000 years old. The new dating evidence from Ksar Akil is largely comparable to these ages, if not slightly younger.